Yes, it’s the thought that counts. But be honest, don’t you feel so much better when someone has chosen a gift for you that encompasses those special things in life for which you have a passion? Call it a unique gift, a specialty gift or a gift for him or her, but any way you look at it, it is your way of saying you think that person is special. So the next time you need to get a gift, ask yourself first, what are the areas of interest of my special someone, then start to zero in on an ideal gift. If your special someone has an interest is history, the military, sailing or flying we have some ideas for you. No matter what price range you have in mind, there are gifts available. Let’s focus on the lower end of the range and work our way up. Books and movies are always a good special interest gift. For example, a person interested in the Napoleonic era might enjoy the The Sharpe series from Bernard Cornwell which is a well researched fictional account of the wars. Those interested in flying or boating may enjoy a book on the history of their favourite mode of travel, or a book highlighting the greatest boats or planes ever built. There’s also biographical books related to the people who piloted them. Peruse our suggestions or set up your own search. Now how about the military history buffs on your list? If you are buying for a man chances are he played army with toy soldiers when he was young. That little boy is still lurking within. 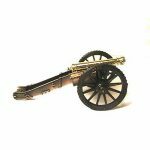 How about a Revolutionary War Cannon for his library shelf or desk> You can start him collecting toy soldiers with his favourite person in history like George Washington or Napoleon, or you can select a small grouping to put on a desk or library shelf like the Continental Canon and Crew from the Revolutionary War. Another option is choosing his favourite soldiers on parade complete with drums and colours, like the Black Watch Band and Black Watch Colour Party parading. You can also put together a small regiment of soldiers to begin building his battle scene. You will have a wide range of prices from which to work if you embark on this path. IF you should select D-Day, for example, you could start with a Group on the Beach, then add the Paratroopers, a Mortar set, an Attacking patrol and so on. If you choose a large enough collection you may want to house the collection in a glass case and present it as a very special addition to his or her favourite room. And while we are on the subject of military, how about a colourful addition to your special someone’s bar. Ice buckets are a necessity but wouldn’t an ice bucket in the shape and detailed design of a regimental drum make a nice statement? Just get an idea on which military regiment is of most interest and order one. It will not only be nice to look at as a decorative addition to the bar, it will be useful as well! A chess enthusiast with a military bent can be especially fun to buy for. Turn that game of chess into a historic battle where strategies and tactics don’t just win the game they win the war and define the future. An American Civil War, Waterloo, or Revolutionary War chess game finely detailed and painted is an attractive addition to the room and an adventure to be relived again and again. Now for the nautical or aviation hobbyist on your list. What better gift than a carefully crafted and designed wooden model of their favourite ship or airplane. A tall sailing ship like the Cutty Sark or the Bounty setting on a shelf in a library or on a credenza in an office will serve as a regular reminder of your thoughtfulness and their favourite dreams. And if your special someone can’t be in their airplane, why not have an airplane model for them to gaze at on a regular basis whether it’s sitting on a mount on the wall, on a shelf or hanging from the ceiling. So the next time you are stumped for that unique gift that says ‘you are special’ just dial in to their area of interest and start shopping. You may want to review some of these products about military history. If you are interested in Egyptology, the famous Egyptologist, Christian Jacq has written a whole series of painstakingly researched historical novels, several highlighting the reign of Ramses the Great. There are also a good number of excellent books on ancient Egyptian history available on Amazon.